Do you have a tot? What to celebrate Shabbat? 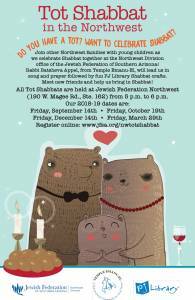 Join other Northwest families with young children and we celebrate Shabbat together at the Northwest Division office of the Jewish Federation of Southern Arizona. Rabbi Batsheva Appel, from Temple Emanu-El, will lead us in song and prayer followed by fun PJ Library Shabbat crafts. Meet new friends and help us bring in Shabbat! All Tot Shabbats are held at Jewish Federation Northwest (190 W Magee Rd., Ste 162) from 5p.m. to 6 p.m.